The most recent car booking in Günzburg Donau has been made on our website 4404 minutes ago. In Günzburg Donau, we offer for rental 4+ car categories from 2+ rental suppliers. Low prices. OrangeSmile.com offers vehicles for rent in Günzburg Donau at guaranteed low rates. We are able to offer the best rates since we work with our car suppliers in Germany directly, and besides that, we select and provide you only the most beneficial offers at the time of your search. Rental conditions. To rent a car in Günzburg Donau via OrangeSmile you should possess a valid credit card and a driving license for more than one year without serious accidents. Prior to reservation completion, please read the rental conditions for your selected vehicle. Picking up your vehicle. All the information and the address of your rental office in Günzburg Donau will be specified in your voucher. Upon arrival, you are expected to present your voucher, driving license and credit card. Please make sure that the invoice and other documents, obtained from the rental officer, are correct and do match with your voucher data. Do not forget to inspect the car prior to taking it from the parking lot. Delivery. When returning your car to the rental location in Günzburg Donau, check with the desk that they have no claims regarding the vehicle, and all the rental papers and the receipt are in your possession. We wish you a trouble-free driving around Günzburg Donau! Just north of the city is another great place, a kind of Mecca for connoisseurs of aesthetic pleasure - Kuhfluchtwasserfälle. This location is included in routes of many tours held from Garmisch-Partenkirchen, and each one offers its own interesting activities. 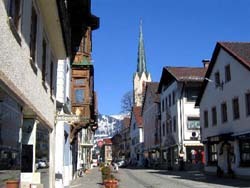 For example, All Things Garmisch sends tourists to the very fairytale Bavaria with its myths and legends, Alpenmove e.K. invites you to explore the city in a more modern way - on segway, which will definitely be fun and easy, and Bergsteigerschule Zugspitze provides an opportunity to explore the mountains. If there is a desire to increase the adrenaline level to "above average", be sure to try skydiving. In the city, such a fantastic opportunity is provided by Fly-Garmisch. Another interesting pastime can be a cable car trip, and in this case, you should book the tours from Partenkiirchner Bergbahen, Skischule Zugspitze-Grainau, and Eckbauerbahn. The following centers are perfect for those wishing to swim: Alpspitz-Wellenbad, Zugspitzbad or Warmfreibad Farchant where both adults and children are always warmly welcome.